The 1st year students in St Aidan’s Comprehensive School in Cootehill, Co Cavan organised a 10km fundraising walk in memory of a much-loved former pupil of the school, Karen Jackson. Karen died recently at a tragically young age. The students’ objective was to fundraise for the Liver Unit in St Vincent’s. 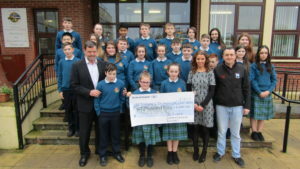 Having undertaken this gruelling endeavour the students raised the magnificent sum of €2,000 for the Unit. 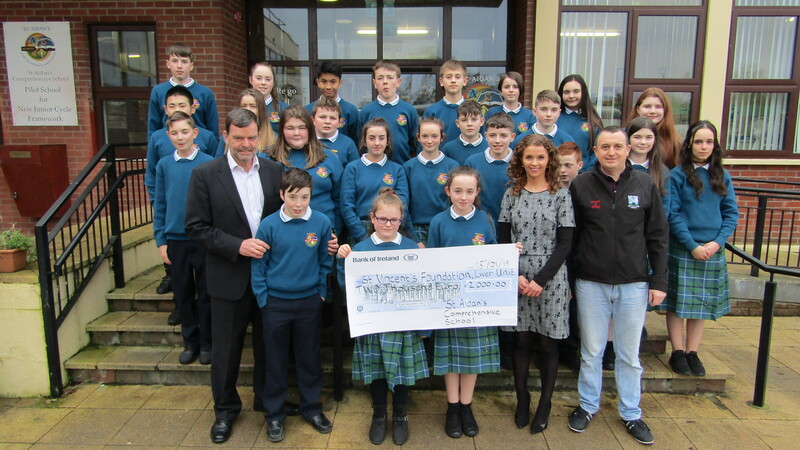 Pictured below are the students presenting their cheque to John Hickey of St. Vincent’s Foundation in the company of Tom Jackson, Karen’s Dad and Sinéad Ni Bhaoill who organised this activity. On behalf of our patients we are extremely grateful to the students and to their teachers in the school. In this we want to, particularly, thank Sinéad for her contribution.